Published on 14 July 2012. This is Newcastle’s former Grand Hotel, built in 1891. I’m not sure when it stopped being a hotel, but it now houses a Health Fayre sandwich shop, a branch of Blackwell’s, a Campus Coffee shop and Newcastle University accommodation. One interesting conundrum about this building is its location. The road you can see running in front of the shop changes at some point from Percy Street (to the left of this picture) to Barras Bridge (to the right). The Grand Hotel building is listed by the Council (and the architects’ original plans) as being located at 1-24 Barras Bridge. Yet Health Fayre, Blackwell’s, and Campus Coffee – which are all located within the building – are listed being on Percy Street. 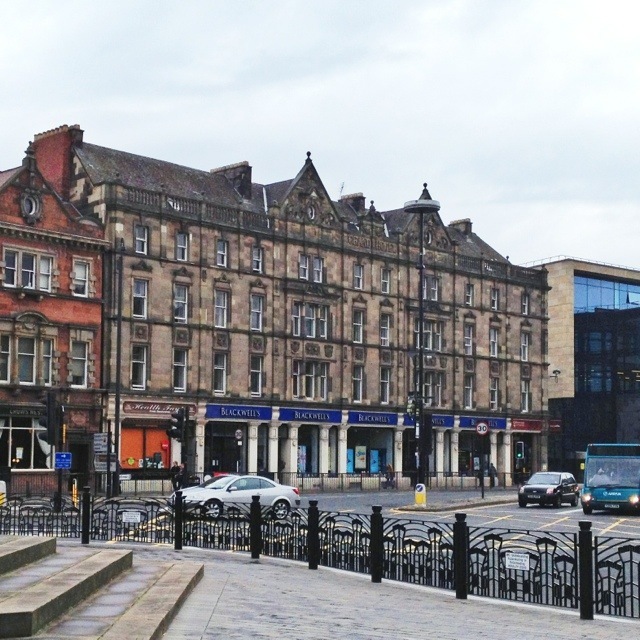 However, the Newcastle University accommodation situated above these shops, and whose entrance lies between them, is listed as being on Barras Bridge. So there’s the intriguing reality of several doors located next to each other on the same side of the same building, with the middle one listed as being on a different street to the others! I’m glad I’m not a postman! This 1,723rd post was filed under: Photo-a-day 2012, Architecture, Newcastle-upon-Tyne.